While many of you have likely heard of some of the previous metrics before, I suspect that some of the ones presented today will surprise you. We’re going to start getting into actual performance here, as well as how the system succeeds while in action. 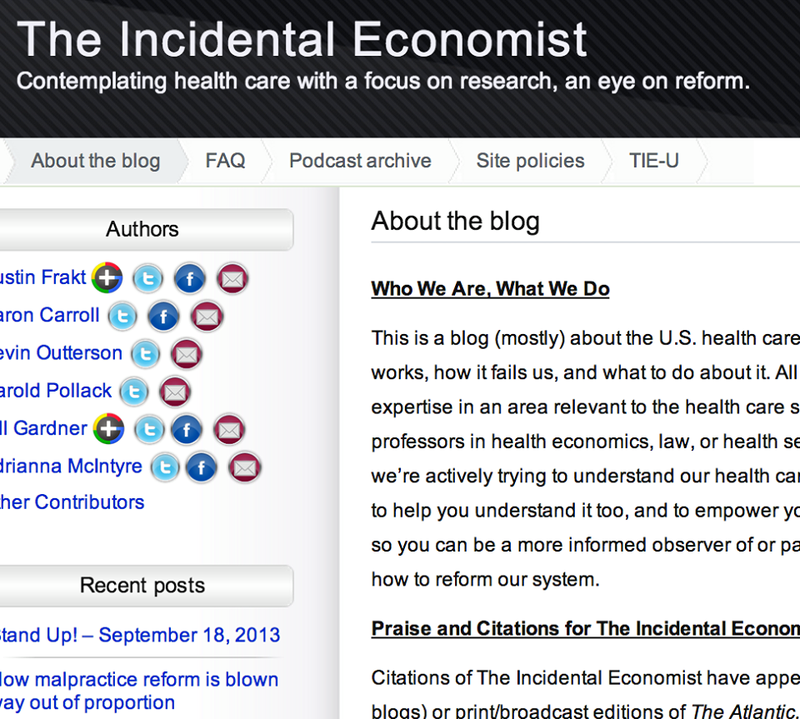 We’re going to look at utilization, or how much people use, or get to use, the system. Let’s start with some data on prevention. Specifically, we are going to focus on immunizations. 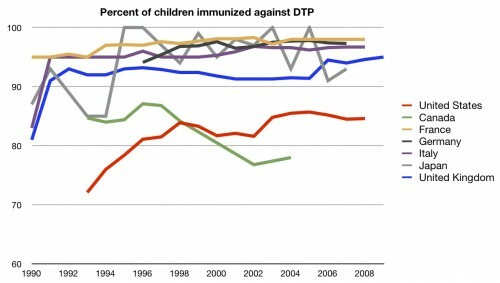 The first is known as DTP, or diphtheria, pertussis, and tetanus. If you want to get technical, these days it’s mostly DTaP, as we are now using acellular pertussis, but that’s besides the point. You’re supposed to get five vaccinations by the time you enter school. So how does the US stack up in keeping kids current by age 1-2 years ? Better! In fact, in recent years, we are near the top. 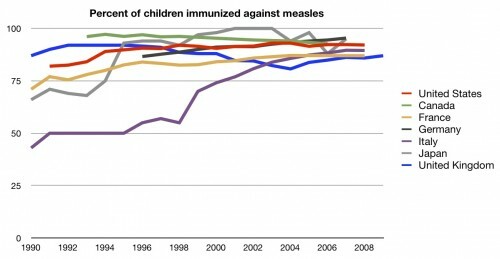 Children aren’t the only population that should be immunized, however. People over the age of 65 should be getting vaccinations against influenza each year. 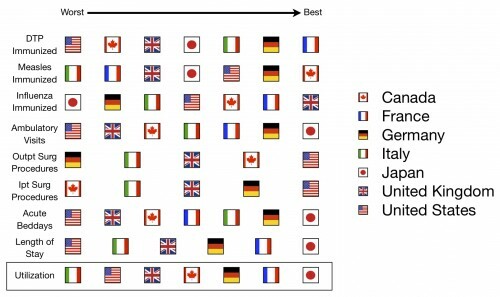 How do countries compare on that metric? Middle of the road there. As always, with the elderly, it’s important to remember that they function in a different system, one of effective universal coverage because of Medicare. Moving past preventive care, let’s head into ambulatory care. How many times do people in the US get to see the doctor compared to other countries? I have to admit, this one surprised me. Making no claims as to whether every visit in every other country is needed (remember, no one metric is perfect), knowing how much more we are spending than these other countries makes the fact that they see the doctor many more times was surprising. How about outpatient surgery? Do we get more than that? You bet we do. Even though there isn’t a whole lot of data for the US, we are clearly out front there. We do a lot of same-day procedures (which we saw in the cost series). A lot. 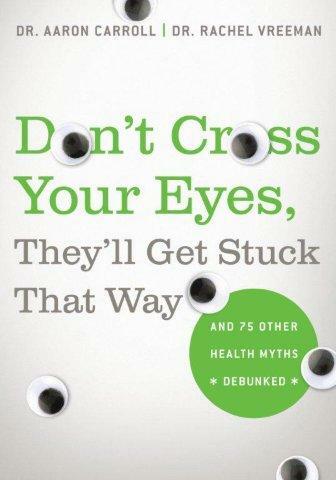 Is it the same for inpatient procedures? Still number one, but not by as great an amount. Certainly there is no question that we are getting many more procedures than any other comparable country. We’ve gone from office visits to outpatient procedures to inpatient procedures. Let’s finish up with inpatient care. How many days does the average person stay in the hospital? 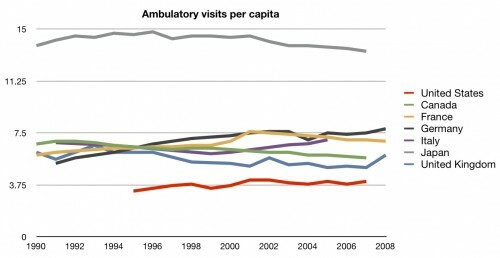 Again, given our costs, it’s surprising that we spend the least amount of time in the hospital. Remember, we’re doing the most procedures. We just don’t get to stay long afterwards. Many people don’t like that. We should look at this from more than one direction. Maybe we get longer stays, but fewer of them? Not so much. 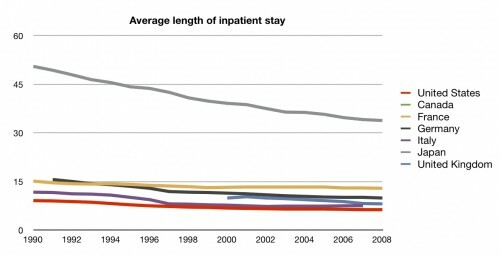 The average length of an inpatient stay in the US is shorter than any comparable country. So how do we do with actual use of the system? 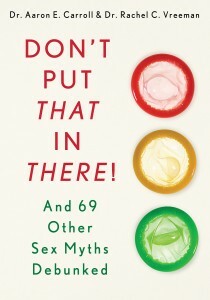 With respect to prevention, we’re middling. We hardly get to see the doctor in the office at all. We do get a lot of procedures, both inpatient and outpatient, although we rarely get to stay in the hospital, and when we do it’s for much less time than other countries. A further explanation of these charts can be found here. UPDATE: I screwed the pooch on this one. Thanks to Michael in the comments, I fixed it. I got the rankings exactly backwards in the overall category and running total. I’ve been traveling and I’m sleep deprived and I’m human. The responsibility is mine, however, and I own the mistake. I committed to sticking to the numbers for the charts. I will offer my own thoughts on the matter (which I bet are closer to yours) in the Conclusion. Again, think of this as how much do we get for out money. We get a TON of procedures, which skew us toward the top. I’m not arguing that this means we have better outcomes. I am just saying that if you value quantity, we do pretty well. I’m surprised you’re weighting the *number* of inpatient and outpatient procedures much more than anything else. Surely the number of procedures points how bad we are at not preventing them? 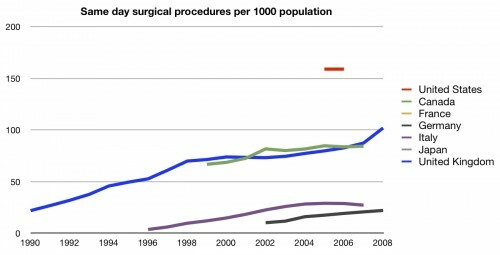 I also have a feeling that short hospital stays have something to do with the number of procedures. To make an argument from anecdata, a couple of my friends had to go back to get their stitches redone after being discharged from the hospital three days after their c-sections. What a pain! *doh, I meant to write “how bad we are at preventing them”. There’s an extra “not” in my original sentence. Some math problems with the aggregate measure today. Japan is 4/7, 4/7, 7/7, 1/7, 1/7, 1/6 on the six categories where it is ranked. Those should average to a ranking better than 6/7. France has the same problem. I’d also like to question the “more is better” underlying assumption, although I think it is safe to say “more services is less rationing”, or “more services is more access”. You guys are killing me. I agree with you. But how well the quantity of utilization works should be seen in things like disease care. 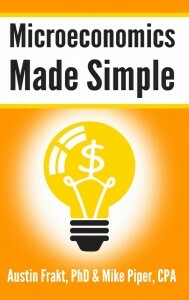 This series describes a breadth of ways to think about what we get for our money. Some people, including me and apparently you, care about the final outcomes. Others care about quantity. I will argue my points and thoughts at the end. But I will not cherry pick data throughout. If I didn’t present this stuff, some would point to the series and say that I ignored the fact that it’s easier to get a procedure in the US than in other countries. I am not ignoring it. It’s in this post. There will be something to like and hate in every post. Welcome to the health care system of the Unites States. Some days I get more sleep than others. I totally screwed up the overall. I fixed it and the composite. Is shorter length of stay necessarily a bad thing? 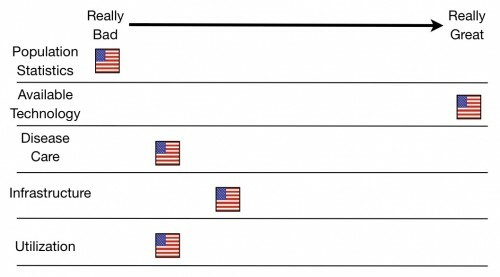 I’ve seen data that indicates not only is USA length of stay decreasing (from 1997 to 2007), but so is readmittance rate. 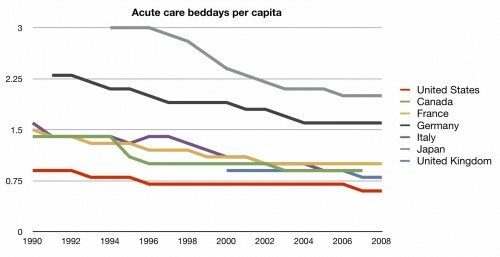 This could indicate that the US is not only providing better care (lower readmittance rate (relative to itself 10 years prior)), but they are also doing it more efficiently (lower LOS). Disregarding costs for a second (which I know is stupid because this whole series is about health care costs, but…), wouldn’t this be ideal? Ah, Aaron, that makes it much more clear. I was under the impression that somehow, for this post alone, you decided to weight the subcategories to give most weight to the number of procedures for some reason. My fault, I was too lazy to check the numbers myself. sorry if you felt attacked, I certainly didn’t mean to sound like that! 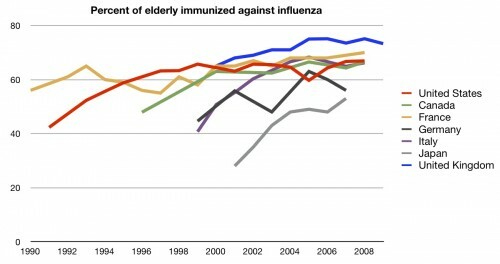 Outside of the immunizations, which Americans do poorly on, less might be better. And yes that is even true for ambulatory visits. Less might be better but should it also be more expensive? I think the series is intended to look at whether the United States is getting value for its money. 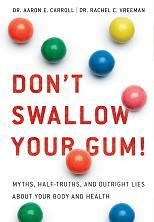 I suspect the author(s) would be appalled if it were interpreted as a recommendation for patient care! Hospital A provides a treatment. It will require a 45 day hospital stay, with a 20% chance of readmittance within 30 days of discharge due to ineffective treatment. Hospital B provides a treatment. It will require a 3 day hospital stay with 1% chance of readmittance within 30 days of discharge due to ineffective treatment. I think I’d be willing to pay more for treatment at Hospital B. This is exactly the point. If we are spending more on healthcare we would expect either superior service, better outcomes, or both. If we are spending more and getting inferior service then we would hope for a positive effect on outcomes. The question is, are we seeing anything like this benefit? The implication often is that these interactions are short but incredibly effective relative to what other countries are getting. From the evidence on outcomes I’m not convinced. Some people seem to mistake modern American healthcare for Star Trek IV. 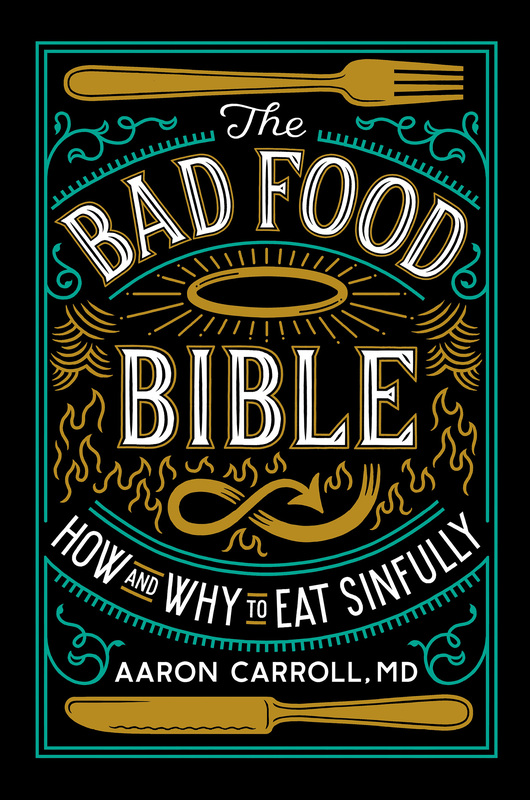 By the way, I’m a doctoral student in health services research, and I wanted to let you know that I have been getting a lot out of this series and the last one (and the blog in general). Thank you so much.